This peak at the north-western region of Nepal is located in the giant Dhaulagiri massif. Some call it Dhampus Peak, others call it Dhambus Peak and sometimes it is also called Thapa Peak. Naming conventions aside, this peak at 6,012 meters is the one and only peak providing close-up views of the Dhaulagiri and Annapurna mountain ranges from a single and exposed viewpoint. Dhampus Peak is often climbed as a preparation and precursor for harder and more challenging climbs in Nepal. Dhampus is a relatively easy climb when compared to other peaks in the country. However, you need to be in a good physical shape and have a certain level of fitness for this combined trekking and climbing experience. Although the climb might not be a difficult one in mountainous Nepal, it still demands some technical skills and a good teamwork. Besides, the striking variation of the peaks will readily inspire you to take on the challenge once you’re near the peak itself. From the summit of the peak, you will have an incomparable vista of a huge range of mountains – including Mt. 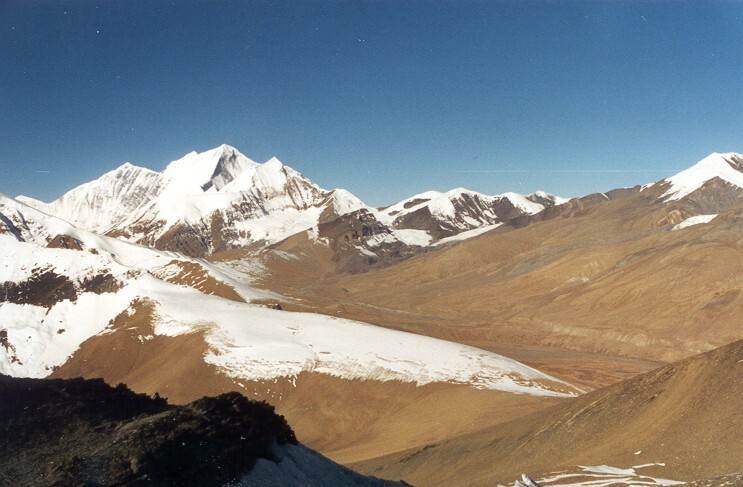 Dhaulagiri, Nilgiri, Tilicho, Tukuche, and numerous other mountains and glaciers. Geographically, when you’re at the top of Dhampus Peak, you will be standing between two great ranges of the Himalayas and also be above Kali-Gandaki, the deepest gorge in the planet. Beneath this reddish gorge flows the gushing Kali-Gandaki River – the mighty river coming straight out of a Himalayan glacier! 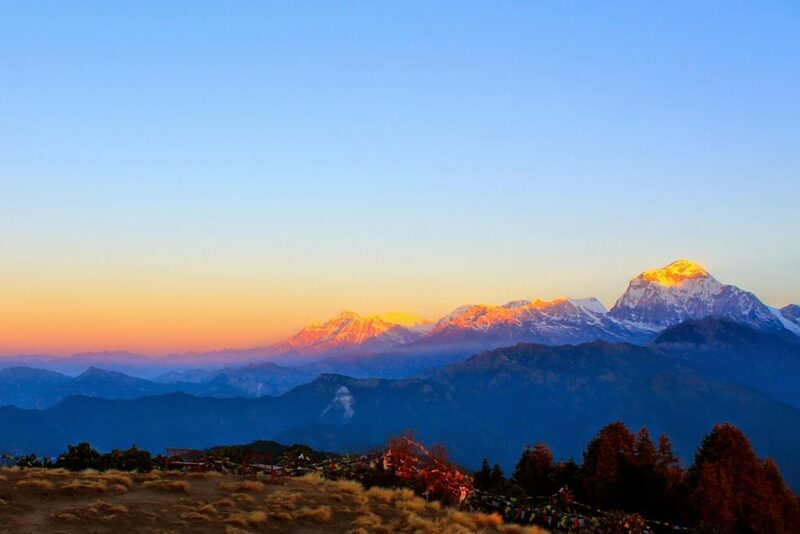 The actual trek begins from Pokhara – passing through several villages and green valleys, deciduous forests of rhododendron and oak, and the evergreen forests of juniper. The trail takes you to Dhaulagiri Base Camp, Italian Base Camp, French Pass, and then on to Dhampus Pass at 5,200 meters and beyond. For an unforgettable trip in the Dhaulagiri range in Nepal, book this trip with Discovery Mountain. With experienced and certified team leaders and guides, we assure you of a pleasurable trek in Nepal. The best times to climb this peak are March to May and September to November. Upon landing at Kathmandu International Airport, our staff will pick you up and transfer you to your hotel. Spend the rest of the day at leisure, and in the evening join us for a typical Nepalese dinner. Stay overnight in a hotel. If you choose to drive to Pokhara, you will be taking a scenic route along Trishuli River. The drive will take around seven hours through winding hilly roads. However, if you choose to fly to Pokhara, it takes a little under an hour. Enjoy the rest of the day around lake Fewa. You start drive after your breakfast through uphill into zigzag road all the way to Naudanda. It then descends through zigzag road up to Nayapul with views of Annapurna South, Fish tail, green hills, terraces and villages. To reach Beni, your drive moves along the bank of Mardi river. This is one of the picturesque road journeys. You begin the first day of the trek after breakfast at Darbang. At first the pace is slow where you can enjoy the views and some more along the way. Villages, farmlands, and terraces are found in the majority of the places throughout the day. We pass the village of Dharapani early on, and later the villages of Takum and Sibang. After a brief stopover, we trek via the village of Phalai Gaun and in the process cross several rivers such as Gatti river, Dhara river, and Myagdi river before arriving at Muri for the night. Boghar, Boghara, or sometimes called Baghar, at 2,050 meters, is the village where we will reach today. Start early after a quick breakfast, descend the trail, and arrive at a suspension bridge over Muri river. The trail then turns uphill amid dense bamboo forests. Trek on, crossing a couple of sheds and farmhouses, and climb on until you reach an open grassy field before arriving at Baghar for an overnight stay in a tented camp. After a quick breakfast, trek along the bank of Marsyangdi river, cross the forest and arrive at Lipshe. A brief stopover, and the trek continues through forests and time-worn villages. You might even encounter some local honey-collectors in one of the villages. The average walking duration today is around five to six hours from Baghar to Dovan, where we will stay for the night in a tent or a tea-house. The average walking distance is four to five hours at a normal pace today. Sallgahari, at 3,020 meters, literally means a forest made of pines. The route today is lined with rows and rows of high-altitude forests of bamboo, rhododendron and pines. At night, we stay in a tent in Sallaghari. After an early and quick breakfast, we head further into our journey. First crossing through pine forests, we continue our trek uphill at a slow and leisurely pace. Gradually the vegetation begins to subside and the landscape opens up to rugged moraines – the location of the Italian Base Camp. The walking distance is three to four hours today before reaching Italian Base Camp at 3,610 meters. Stay overnight at a tent with views of Mt. Dhaulagiri. At this altitude it is imperative that you have a day of rest adapting to the environment. While it might sound like a lazy day, it is best spent on a couple of short hikes throughout the day. Sleep well to save up on energy for the climb ahead. Today you will face some significant challenges in the trail ahead. First you might need to use a rope in a few places which can be done by closely following your team leader. He or she will guide you thoroughly. Further, the trail goes downhill and passing a moraine before arriving at Glacier Camp. The views are stunning and rewarding, but get to rest early as tomorrow you’ll be climbing higher to Dhaulagiri Base Camp. 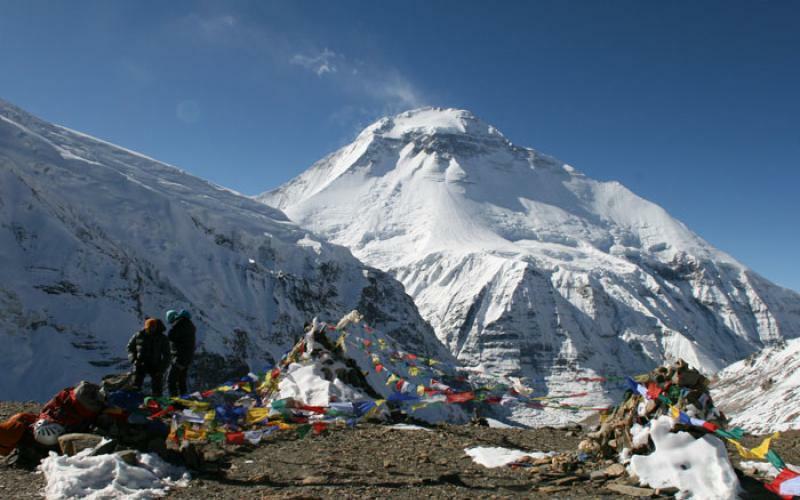 Dhaulagiri Base Camp is located at an altitude of 4,725 meters. The track today begins with rough surface but soon turns slippery and icy. Tread carefully as the chances of slipping are high. 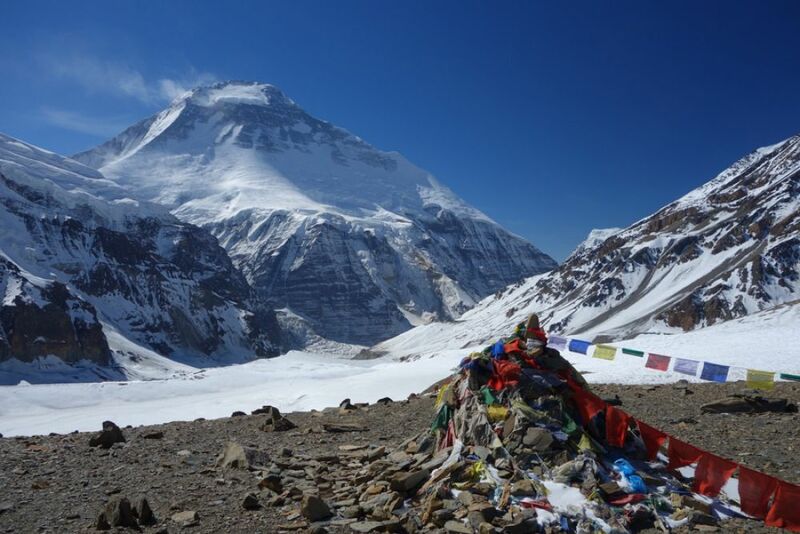 Along the way the views are magnificent and more so at the Dhaulagiri Base Camp itself. Prominent peaks such as Dhaulagiri I, Dhaulagiri II, Dhaulagiri IV, and Tukuche are visible from the camp where you tent-in for the night. Start early, climb over the Chhonbardan Glacier, and walk on along the landscape. The magnificent views certainly leave you spellbound but they come at the price of rugged terrain and hard climb bringing you to French Pass. After a brief stopover, we continue the descent along icy slopes and come to the aptly named Hidden Valley at 5,010 meters. Start as dawn as you don’t want to miss the spectacular sunrise over the highest mountain range on Earth. The challenging trek is four to five hour or even more with stopovers. The views are great along the track before arriving at the Base Camp for the night. While the peak itself is not difficult to climb, the day is full of walking along plain and comfortable terrain. Some sections might demand the use of ropes but you will be assisted by your team leader if needed. Once at the summit at 6,012 meters, you will have splendid panorama of mountains such as Dhaulagiri, Nilgiri, Tilicho, Tukuche, Annapurna, and other peaks of Nepal. This extra day is allocated in case of unfavorable weather conditions that might arise at this altitude and then climb has to be shifted for another day. Else, this day can be used resting at at the base camp and enjoying the experience. Today you will have a moderate walk of around five to six hours. Start at leisure from the Base Camp, and trek down to Yak Kharka – a place that is used to keep yaks. Along the way you will encounter a windy pass called Batase Danda from where you can have one more view of the massif before heading downwards. Jomsom used to be a trading town when business was flourishing between Tibet and Nepal in the middle ages. Today, it is a quiet village at the foot of the mountains. Before arriving at Jomsom we will pass through the village of Marpha, popular for the, you guessed it, “marpha” drink. Enjoy your stay at Jomsom tonight in the vicinity of the mountains before heading back to Pokhara tomorrow. Catch an early-morning flight from Jomsom as later in the day flights are not operated due to high winds. It can get so windy in Jomsom that the locals have stories about flying boulders and sweeping stones! In Pokhara, you can enjoy the rest of day sipping beer by the lake or, if you feel like it, resting in the hotel room. In the evening though, do not miss the Thakali daal-bhaat in Pokhara. Depending upon the schedule, you can drive or fly to Kathmandu from Pokhara. Once you are in the capital, have a free day enjoying shopping, hot-water bathing, relaxing in a sauna, or simply seeing around town. Stay overnight at the hotel.